Yamaha Motor: New XTZ150S Crosser BlueFlex for Brazil Powerful 150cc On-Off Road Model with SUV Feel - News Releases | Yamaha Motor Co., Ltd.
IWATA, February 10, 2014 - Yamaha Motor Co., Ltd. (Tokyo: 7272) announced today that the new On-Off Road XTZ150S Crosser BlueFlex*, powered by an ethanol fuel compatible 150cc engine, will be released onto the Brazilian market in March 2014. Designed for “power and comfort”, the XTZ150S Crosser BlueFlex follows in the tracks of the 2013 YS150 FAZER BlueFlex street model. This is Yamaha Motor’s second model for the 150cc class in Brazil, the highest demand segment in the Brazilian motorcycle market (approx. 1.52 million units, 2013, Yamaha data). These and other features are in response to customers' feedback wanting acceleration performance with ample power reserves, sufficient cushioning to compensate for bumpy roads, and comfort from street riding to long-distance travel. In addition to the above, the front brakes are available in drum or disc specs. Yamaha Motor will continue to work on sales of new models, developing sales networks, and strengthening after-sales initiatives, with the goal of expanding sales in the 150cc class which shows promise of further demand growth. 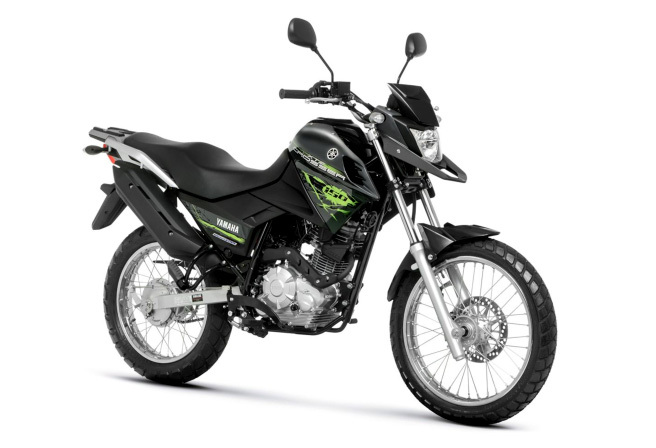 The manufacturing and sale of this model will be carried out by Yamaha Motor da Amazonia Ltda. * Yamaha assigns the BlueFlex branding to motorcycles that can run on gasoline, ethanol, or a mixture of both.